After living with this mish mash for over two years (eek! ), I decided I needed to do something about it. I had purchased three of these little glass spice jars at the dollar store last summer and they were functional and nothing more. I only bought 3, so clearly I wasn't too enamoured with them- I just needed small containers to put my bulk spices and herbs in. Love this! Where do you buy these label things (internationally?) They're so pretty! Thanks Olivia! As far as I know, the blank Martha Stewart labels are only sold at Staples (office supply chain in Canada and US). Perhaps you can buy them online through their website? I customized the blank labels myself, which is not hard at all to do! Thanks! You know, these glass spice jars must be at other dollar stores! My pantry jars are pretty spectacular and I think those might be more difficult to find, but these, I swear I've seen in many a dollar store! They were probably just so hideous you've passed by them in the past, lol! Just give them new life with some spray paint! And please excuse all my typos! Still chugging this latte and haven't quite woken up yet! It looks so much cleaner and organized. I love this. If you open my cupboard most of it will fall out when opening the door. I need to start working on that myself. Thank you so much for sharing. I would not have thought those spice containers were from the dollar store they look to chic. Love it! Thanks! I LOVE the dollar store (clearly), but I only really love the merchandise that doesn't look like it's from the dollar store! And if they do look dollar-store-ish, then customizing like this does all the wonders in the world, lol! Thanks for verifying that I'm not the only one who thinks these look way more chic than they actually are! So with you on that! Mismatched and random sized spice containers just drive me nutty! So much visual clutter! Actually our dollar store spices are about the only ones I buy, I have never had an experience with old or outdated. But this is one awesome idea thanks. Thanks so much Lindsey! The containers actually weren't that cute at the dollar store, so I bet they're easier than you think to find! And you're right about $ store spices! I can't imagine ever using them.... ewwwwww. Definitely start visiting dollar stores! It makes organizing way less daunting and much more affordable! Love those dollar stores-Love the labels too- following you from TDC-stop on by for a visit! Love the labels and the painted lids, they look great! HI Liz- I'm planning on adding a Free Printables page sometime next week which will include a spice label download! It wil only be a sampler and will have just a few labels but will be the most common spices used! After that I will add them to my etsy shop as well in case anyone is interested in a custom set! Love your posts! Have you added the free printables page with common items and also spices. This turned out really nice. I have awarded you the Liebster Awards. Please pop over to check it out. Thanks for stopping by Brooke! Good luck with your search! I just bought the same riser from HomeSense! Great minds think alike!! We used to have a lazy Susan for the spices, but it became over-crowded and everything toppled over if you tried to turn it! Now for the matching jars...you're on to something lady! Awesome idea!! I've been avoiding our spice drawer for months but it's time to organize it. I love, love this idea!! Thanks for sharing. This might be a stupid question, but is the name of the store actually, The Dollar Store? I have a Dollar Tree, Family Dollar and I think a Dollar General. Are any of those correct? I checked The Dollar Tree but they don't have them. Thanks! Hi! No, it's not actually called The Dollar Store! The store is called Dollorama and it's a fantastic chain of dollar stores here in Canada. You might have to hunt around a few dollar stores to try and find something similar. Another reader mentioned Dollar General might have some comparable jars. Good luck! Can't seem to find anything like your nice finds here at our dollar stores in the States. How much would you say your spice containers hold? Like the typical .06 oz-ish store bought mis-matched bottles? Or larger jumbo ones? It's hard to scale the size in the picture :). Love all of your organization tips! I too am a bit of an organizing junkie!! Hi there! FIrst off- the jars actually don't look "nice" when you see them at the dollar store, so don't give up! They look pretty cheapo and unimpressive in their original state and it's only after their makeover that they actually look pantry worthy. And secondly, I'm not sure how much they hold exactly, but if you look at the very first picture you'll see the three small jars beside other store bought jars. They are close to many store bought spice jars, but on the smaller side. Hope that helps! Thanks for stopping by! I purchased the identical jars from Dollarama and then I bought the Spice Stack #26552 from Taylor Gifts for $39.98 to hold the bottles. It works perfectly and is such a tidy way to store the Dollarama spice bottles. It fits into my cupboard easily in the same space as a carousel, but with the pull-down trays/shelves, each bottle is in the front row! Highly recommended for spice storage. I also bought the Dollarama slanted glass canisters ($2 each) for storage of rice, quinoa, lentils, barley, etc. They fit into a smaller space than tall jars, but hold lots because of their squatty shape. I saw those slanted jars there! They are too cute! And great idea about the spice stack! I certainly considered something like that and still may do it in the future. Thanks for popping by! Oh, it's lovely! One of the better ones I feel I saw at the link party. I'm a dollar store NERD, so this is right up my alley - thanks for the advice! Ahhh. More to drool over. Come on. I suddenly want to rip apart my pantry. Enjoy our weekend. PS. . . your photos are really well done! My dollar store doesn't have nearly the good stuff you find. Is there a link to download your labels? Not for these, but check out my "Freebies" page for other label download. Hi Jen you are my inspiration. I'm in the process if organizing my house and I live the dollar store. I make my own cleaning supplies and also use natural solutions to make them. So I buy dollar store spray bottles and microfiber cloths, etc. 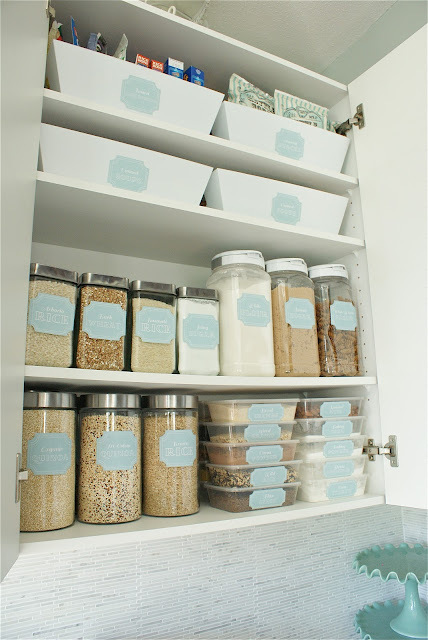 I hope I can find canisters like your finds for my fridge and pantry. I live labeling a well but don't really know good designs like yours. For my pantry I just used clear packing tape to tape both sides for the laminate feel...I know... So lame... I'm wondering how you glue the labels on the containers so nicely? Hi! I'm not home right now and I'm really not sure, but if I were to guess I'd say 4 ounces? Sounds about right, thanks! PS love your blog, I'm from NZ and I wish we had dollarama stores here! Thanks for showing what one can do with the leftover spices that don't fit into the jar. I wanted to get spice jars like this, but always wondered what to do with the excess after filling them lol. Also, the idea of painting the lids to tie into a colour scheme was a nice touch. I have to look for labels now. Hi Jen! I love this idea! Are you still selling the spice jar labels on your Etsy site? I didn't see them and would love to purchase them from you. I hardly ever take the time to type in comments but this I like. 2 thumbs up!! Love it! I would like to try something similar in my kitchen when I have the time. Thanks for the info on the plastic riser. I didn't even know what it was called but I am going to order one. So handy, especially since I have a cupboard full of Indian spices plus dried herbs.